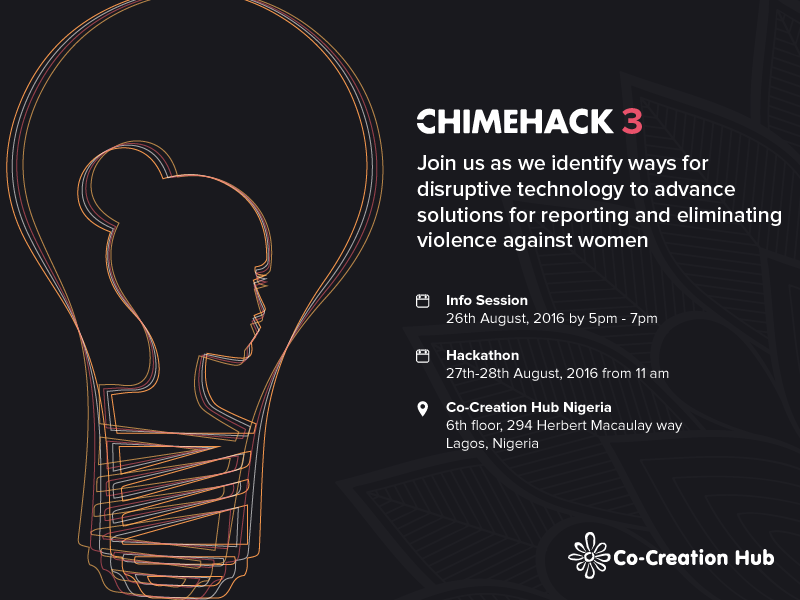 Co-Creation Hub (CcHUB) in partnership with CHIME FOR CHANGE, Global Citizen, and Facebook is inviting you to participate in CHIMEHACK 3, a two-day hackathon to identify ways & build technology solutions leveraging social media for reporting and eliminating violence against women. CHIMEHACK 3 will leverage on social media to find solutions that will focus on reporting and eliminating violence against women and girls around the world. The hackathon will bring together hackers along with issue experts and non-profit leaders to create tech-driven solutions focused on gender equality. Selection and award prizes will be based on a range of criteria including best product, scalability and global impact, user experience and design, engineering excellence and most original. Venue: 6th Floor, Co-Creation Hub (CcHUB), 294 Herbert Macaulay way, Sabo, Yaba. Lagos.